2019 should be a good year for MLPs and the other income investments I recommend in Peak Income. I just added two MLPs to the model portfolio last week, one that yields close to 10% and another 8%. The Fed's recent reversal of course shows that it's worried about growth starting to cool, which usually means inflation expectations tend to cool with it. If you're looking for income these days, your options are a little limited. The S&P 500 yields less than 2%, which is bordering on pitiful, and government bonds aren't much better. REITs, as a sector, are reasonably high yielders at 3.9%. But in order to get the yields I like to see, you really have to cherry pick. You're not paying many bills with a 3.9% payout. Meh. 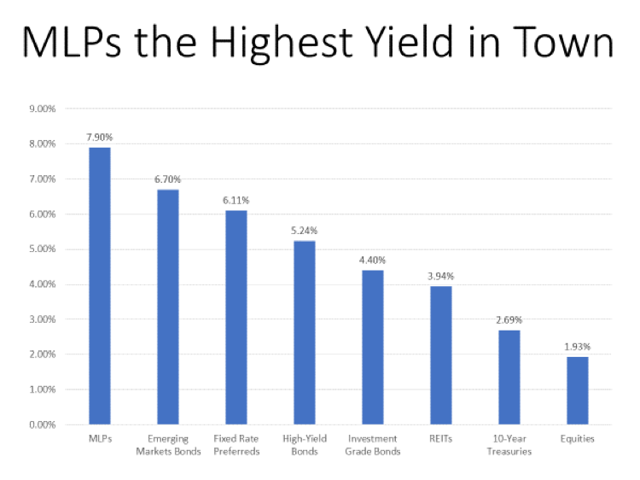 Investment grade bonds yield 4.4%, and "high-yield" junk bonds yield only slightly better at 5.2%. Sure, that's better than Treasury yields. But hardly worth the risk. At the first whiff of an economic slowdown, junk bond default rates tend to jump. Preferred stock still sports a respectable yield, which is why I added exposure last month in my income service Peak Income, as do emerging market bonds for those with the stomach for the volatility. But frankly, there's only one asset class right now that sports what I would consider to be a truly impressive yield, and that is oil and gas master limited partnerships (MLPs). The Alerian MLP index, which you can think of as "the S&P 500 of MLPs," yields over 8%. I know of no other sector where those kinds of yields are possible without taking substantially more risk. (Business development companies, or BDCs, offer comparable or higher yields, but I consider them a little riskier at this stage of the business cycle). Call me a cynic, but when I see yields that high compared to virtually everything else, I want to know why. There has to be a catch, right? Well, there is and there isn't. Yields are high in part due to rising payouts over the past few years. But the far bigger reason is the total collapse in MLP share prices since late 2014. After years of gains, the sector hit a rough patch when the price of crude oil started to fall, and before the dust settled the Alerian MLP index has dropped by about 60%. The story on MLPs had always been that they were largely immune to energy price swings. MLPs own energy infrastructure, such as pipelines, and most of their revenues come from fixed fees. The problem came down to leverage. 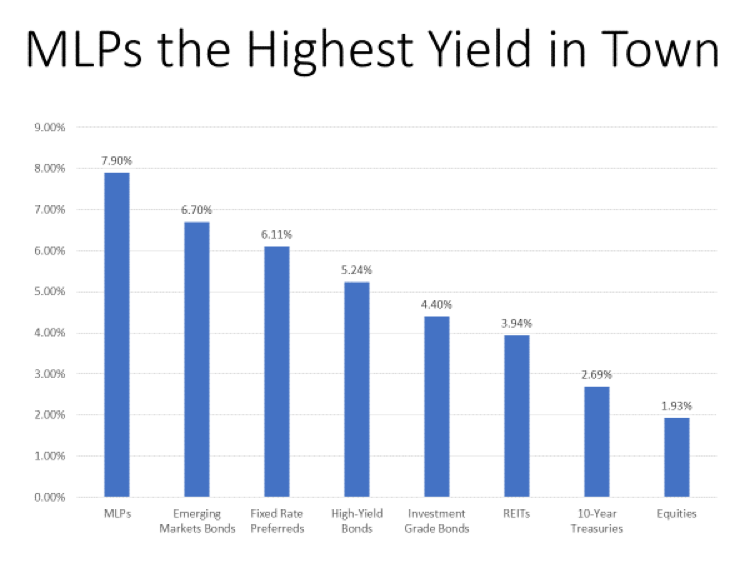 Like much of the rest of corporate America, MLPs took advantage of the low interest rates of the past decade to absolutely gorge themselves on cheap debt. And their business model was dependent on it. MLPs paid out substantially all of their cash flow from operations as distributions to investors. That meant that when they needed capital to expand their businesses, they had to get it from the capital markets via new debt or equity sales. That model worked fine so long as stock prices were high and bond yields low. But when crude oil prices started tumbling in late 2014, MLPs had a big problem. Even if their business models were only minimally dependent on energy prices, they had no margin of safety. When share prices started falling, it became harder to sell shares to raise capital, and raising more via debt wasn't an option because they were already overleveraged. So, the MLPs raised cash the only way they could: by slashing their distributions. It's a case of once bitten twice shy. Investors who saw their payouts slashed back in 2015 and 2016 and lived through a 60% share price collapse have been reluctant to come back to the sector. But their timidity is our opportunity. After years of debt reduction and a focus on financing growth projects with retained profits like normal companies, MLPs as a group are in the best financial shape in recent memory. If we have another energy price rout, they're in a much better position to ride it out. 2019 should be a good year for MLPs and the other income investments I recommend in Peak Income. I just added two MLPs to the model portfolio last week, one that yields close to 10% and another 8%. A "sweet spot" for income investments tends to be moderate economic growth, benign inflation and a 10-year Treasury yield under the psychologically important level of 3%. The Fed's recent reversal of course shows that it's worried about growth starting to cool, which usually means inflation expectations tend to cool with it. And the 10-year Treasury is hovering around 2.7%. So, it's looking good in income land. Disclaimer: This material is provided for informational purposes only, as of the date hereof, and is subject to change without notice. This material may not be suitable for all investors and is not intended to be an offer, or the solicitation of any offer, to buy or sell any securities nor is it intended to be investment advice. You should speak to a financial advisor before attempting to implement any of the strategies discussed in this material. There is risk in any investment in traded securities, and all investment strategies discussed in this material have the possibility of loss. Past performance is no guarantee of future results. The author of the material or a related party will often have an interest in the securities discussed. Please see here for a full disclaimer.